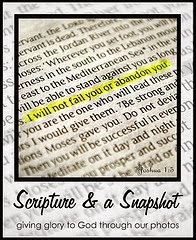 Joining other bloggers in praising the Lord through photos and His word . . . click below to be blessed! May he always live within that circle of blessing! Visiting from Scripture & A Snapshot! Living within the circle of God's blessing...best place to be! I love the play on words you did with the focal circle. What a fantastic post, and a great analogy, and a wonderful prayer for your little boy! Thanks for sharing! Oh I love that! Great pairing of verse and image. Thanks for sharing this beautiful promise from the book of Psalms! Hi April! What a lovely photo, and I am so happy that these are the children to inherit the earth. So innocent and fun!